For all the latest designs hit the Facebook or Twitter buttons above. To order any prints you see here or to commission a custom design click 'Buy One' at the top of the page. Portraits and Crowds made entirely from any words you wish. Prints sold worldwide and razor sharp to A1 poster size. Custom-made just for you or choose from a huge catalogue. Any lyric from any album. 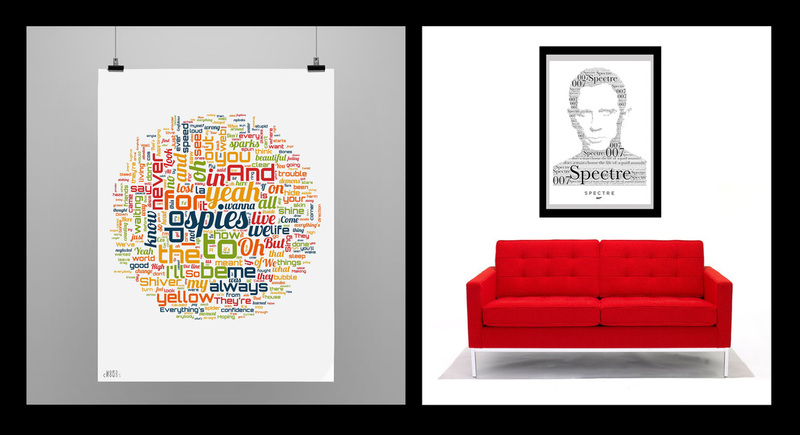 Any word from any list you can think of, every quote from a film as a Word Crowd. Or any sound turned into a Shiver made using real oscilloscope readings. 'I LOVE IT!' - Bryan Adams. Yes, that Bryan Adams.